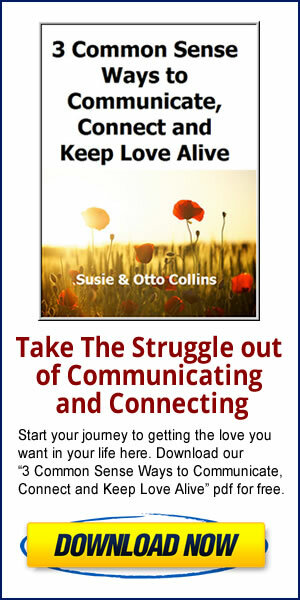 …a VERY simple “tweak” that we want to share with you that could make all the difference to help you experience more love. Wow! In reading hundreds of replies from men, this woman came up with a couple of really big “gripes” that many men have about women. We’re certainly not picking on women here because there are an equal number of ways that women are frustrated with their men. But whether you’re a man or a woman, there’s a lot to learn here about how to keep love and intimacy alive and strong over the years! Sara and Rob had been together for 15 years and although they’d say they got along pretty well, there were many times when they just didn’t understand one another or seem to speak the same language. And their frustration with each other could blindside them over just about anything. Lately, Sara’s been having to take increasingly more care of her 85 year old mother who still lives in her home a few miles from Sara and Rob. Sara feels like her life was already busy but now it’s even more impossible to get everything done that she thinks should be done. She’s finding that she’s really angry that Rob doesn’t seem to see all that she has to do and volunteer to do more around the house. And she takes it out on him by being cold and pulling away because she thinks that if he really loved her, he SHOULD already know what she needs–and do it to help her out. Although he knows that Sara’s under a lot of stress because of her mom’s health, he’s becoming increasingly angry with her because she seems so angry with him and he doesn’t know why. They’re snippy with one another, they seem to argue about everything and neither one of them knows how to get back to feeling the love they once felt for one another. –Sara could figure out what Rob could do to help her and then make a request that he could hear. In order for that to happen, she would need to let go of her belief that Rob should be a mind-reader, admit her feelings and make a clear, request. By admitting what she’s been feeling, it takes all the defensiveness out of Rob and he can listen to her request with more of an open heart. –Rob can become more tuned into Sara and in order for that to happen, he would need to stop telling the “story” that he can never win and can never understand her. It becomes a self-fulfilling prophecy when he does. He can learn to bring himself into the present moment without his “story” when he sees that Sara is agitated. 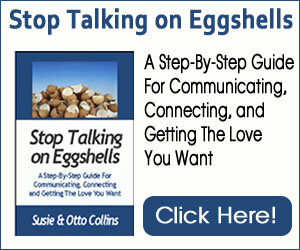 Both of them can practice the skills and techniques that we teach in our Stop Talking on Eggshells program about how to speak your truth without pushing your partner away. 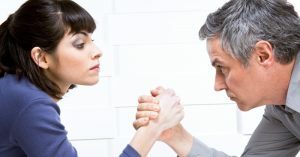 If you’re caught in an emotional standoff with your partner and you want to get back to the loving you once felt, it’s time for one or both of you to let go of holding on to your preconceived assumptions about the other, be direct and clear and open the door to heartfelt communication. Our desire for you is to have the love that you want and walking through that door is one way to bring it to you.